← Zero-Day-Exploit (May 2016) in Windows? Recently some reports claimed that Microsoft went to far in it’s push to update existing Windows 7 and 8.1 users to Windows 10. The reports suggests, that Microsoft has taken another step toward making the process of opting out from Windows 10 upgrade nearly impossible. Here are a few details and some thoughts. It’s still less than 2 months, till Microsoft’s free Windows 10 upgrade offer for existing Windows 7 and 8.1 users ends. And yes, Microsoft is pressing existing Windows 7 and 8.1 users to update to Windows 10. Installing the Get Windows 10-App (GWX) via Windows update and showing the Update nag screen is annoying. Also a lot of user systems seems to end “damaged” after Microsoft tricked their users to run the update to Windows 10. And the 31 day rollback promise is just a kind of “vaporware” – in theory there is a rollback option, but I’ve seen enough user reports within forums claiming, that a rollback failed or resulted in random errors on the recreated Windows 7 or Windows 8.1 system. Within the last days I’ve seen several reports claiming that Microsoft has taken another step toward making the process of opting out nearly impossible. Mary Foley wrote an article Microsoft makes blocking Windows 10 ‘Recommended’ update near impossible: Report at ZDNet.com. And other blogs has referenced the story (like MSPowerUser with the article Avoiding the Windows 10 upgrade offer is now a lot harder). All articles are based on the article Windows 10 nagware: You can’t click X. Make a date OR ELSE published from The Register. And this article misinterpreted the screenshot shown above. The Register wrote, that the screenshot was send by a reader (from what I see, the shot was taken by Martin Brinkmann or one of his co-authors from ghacks.net). 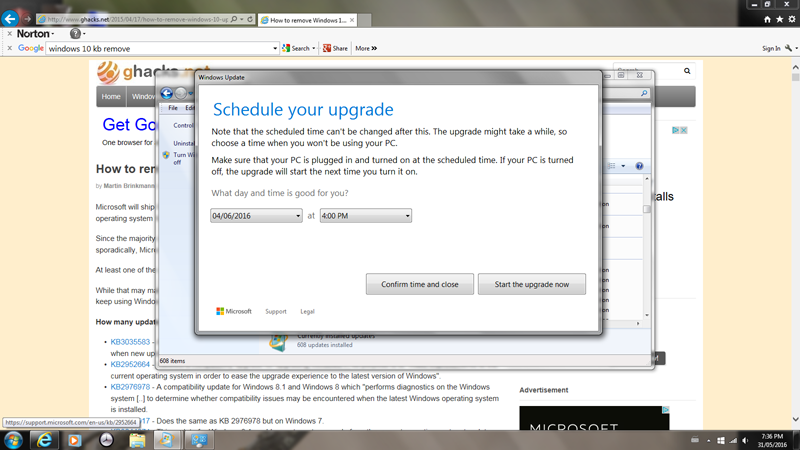 All it shows is a Schedule of an upgrade dialog box. Inspecting this dialog box shows, that there is no X button to close the window. There are only buttons and controls to change the schedule time, to confirm the schedule time and to start the upgrade immediately. But interpreting the isolated dialog box is only half of the truth. Reaching this dialog box requires to reserve a Windows 10 upgrade and actively triggering the upgrade schedule. And one of the steps (precisely the last step) ends with the dialog box shown above. But before a user reaches this dialog, he/she has to confirm actively 3 times, that an upgrade to Windows 10 is intended. My MVP colleague Martin Geuß has documented this within this German Fenster schließen bedeutet Zustimmung: Das nächste Märchen vom Windows 10 Zwangsupgrade blog post. Side notes: The article from Martin, linked above, is just a description, how Windows 10 upgrade has to be activated on a single test machine. It’s not a “proof” that the upgrade will be processed on all scenarios and all cases in that manner. Microsoft has issued too many Get GWX App updates during the last months, that I guess, nobody can precisely predict, how a machine reacts on an upgrade offer. Overall it’s a false alarm, and Mary Foley has updated their article in a way that the initial The Register report was inaccurate. Microsoft has not respected users’ right to know and choose, especially since the company may eventually profit from the unwanted upgrades. The company has abused its dominant market position and broken the market order for fair play. …users or consumer protection organizations have the right to file a lawsuit against the company. 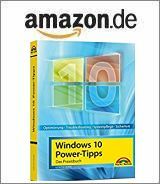 I wrote a lengthy blog post Windows 10 Zwangs-Upgrade: Keine Chance zu entkommen? (only in German) where I’ve analyzed the behavior and also have had a look at the legal terms for vendors here in Germany (and Europe). I fear, Microsoft’s behavior is a No Go from a view of ‘fair customer threatening’ and yes, they tricking users into an upgrade. This behavior is what we know from malware and it has resulted in a dramatic lost of trust into Microsoft’s customer policy. Many users of Windows 7 and Windows 8.1 are deactivating Windows update to avoid upgrading to Windows 10. I think, Microsoft will facing a couple of plaintiffs filings against it’s Windows 10 upgrade policy. Any further thoughts and comments? PS: To avoid an accidental upgrade from Windows 7 and/or Windows 8.1 I recommend my article Block Windows 10 Upgrade using GWX Control Panel.